When he was ten years old, Rick Rohoman, the new French and Spanish teacher, developed a passion for French and Spanish, and he never lost it. This led him to take both languages in high school, and eventually major in World Literature in French and Spanish at UCLA. And now he is here, at La Cañada High School, teaching for his 14th year. Mr. Rohoman grew up in Georgetown, Guyana in South America. He came to America as a teenager and attended UCLA, where he earned both a bachelor’s and a master’s degree. 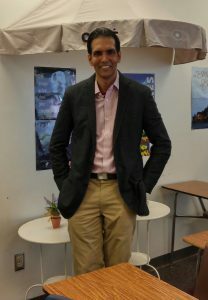 Graduating from UCLA, he progressed to teaching at Foshay Learning Center in a collaborative outreach with USC’s Neighborhood Academic Initiative program, a college preparatory program for disadvantaged students. He subsequently worked for LACOE, the Los Angeles County Office of Education. So far, Mr. Rohoman loves LCHS because “everyone is so warm and so welcoming and students value learning here.” He is very happy to be in a place where students value education and are interested in what he has to share. He even said that he feels at home at LCHS, because he senses everyone’s thirst for knowledge. Although Spanish and French have been his primary interests, they are not his only ones. Mr. Rohoman has a love for language as a whole, as he is also fascinated by etymology, the study of word origins, changes in their formations, and the word relationships among languages. But besides his profession, Mr. Rohoman also enjoys spending time with his family, as well as indulging in his hobbies such as listening to music, snowboarding, reading, and traveling. Is Late Start A Good Start?